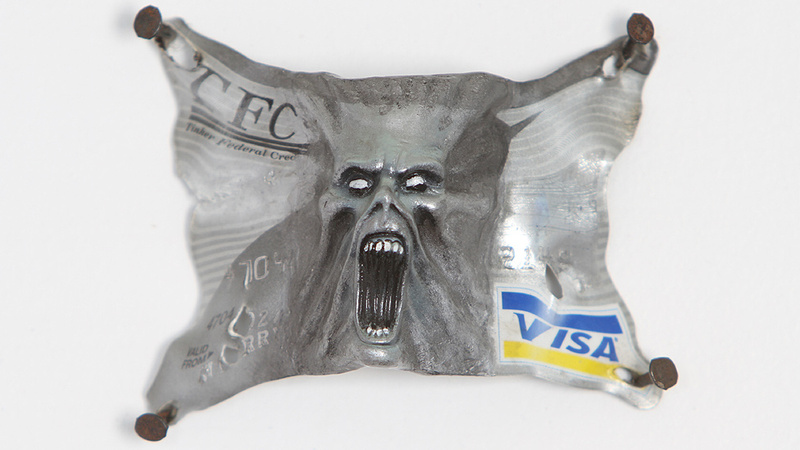 California-based artist Cain Motter explains the inspiration behind his credit card sculptures. "I started college in 1994 and they apparently sold students' information to banks, so I received credit card applications in the mail. I didn't have any intention of using them but one bank said it was good to have in case of an emergency, so I decided to get one." "A couple of weeks later they sent out a $50 (£32) cheque made out to me so I put it in my account, but then I got a bill and it turned out to be a cash advance. I couldn't believe they could operate that way and was really mad, so I decided I would figure out a way I could reverse that money flow and have money coming back to me." 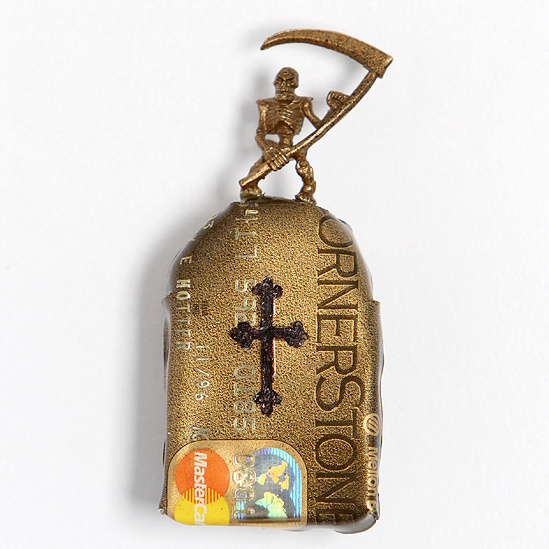 "I first made pendants out of the cards, but no-one was interested and I was getting frustrated so I thought I'd just burn it. I was trying to set it on fire and that's when it turned to a rubber consistency. So I pulled and stretched it and as soon as I saw how elastic it became I knew I could work with it." 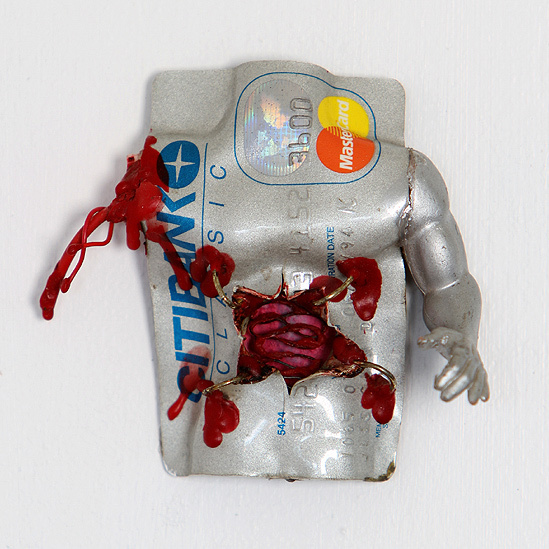 "I then accepted all credit card applications to use them for art, but in time I ran out of money. I had all these credit cards so I actually started using them to live and now I'm in the same situation as a lot of other people in debt." "At some point I'll pay them off with the money that I'm making from the cards. I wanted to rise above the whole mess but it is more entertaining this way - it's like feeding bacon to a pig. But I don't spend on credit cards anymore." 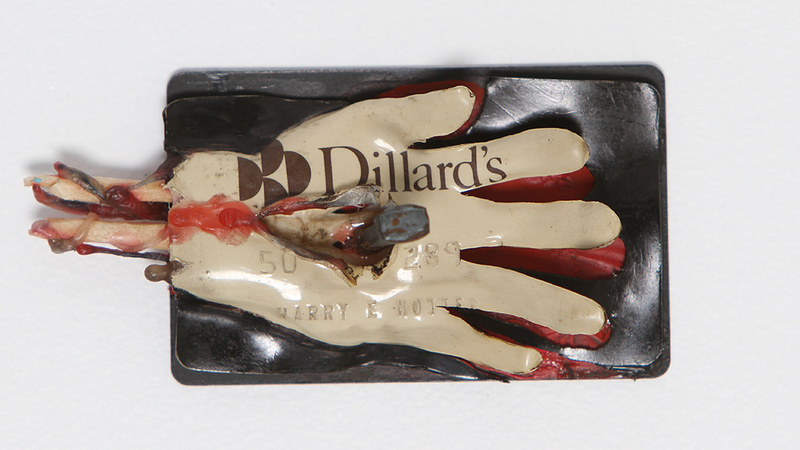 "I did a show in 1995 with about 10 card sculptures and no-one was ever on the same page as me - everyone was happy with their credit cards. But I said: 'Just wait, if they can trick me then there’s a lot of other people that are going to fall for this.' I've been doing it all these years and finally a lot more people relate with me." 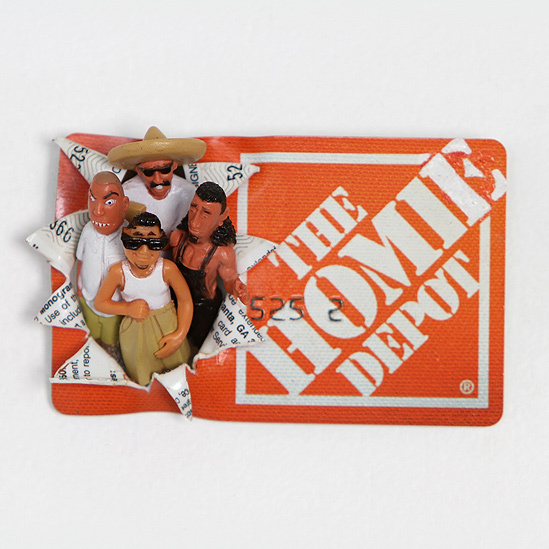 "I only sell prints of my sculptures because my goal is to get my whole collection of credit and store cards into a museum like the Smithsonian because it's culturally relevant and credit cards will become obsolete in the not-too-distant future." 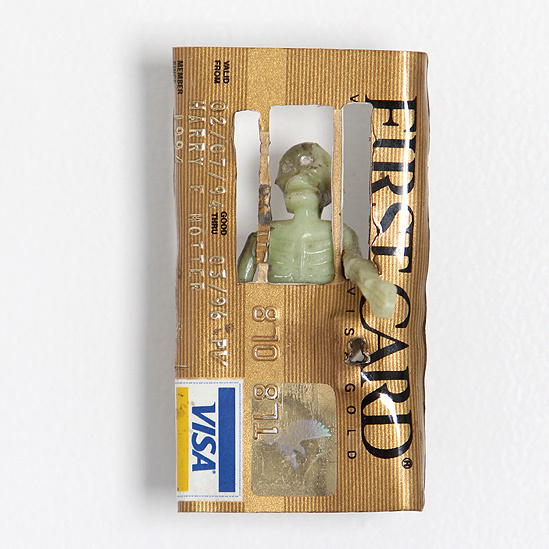 "I've also started recreating my small sculptures into the large, so I've made a credit card guillotine that's 8ft tall with a steel blade. 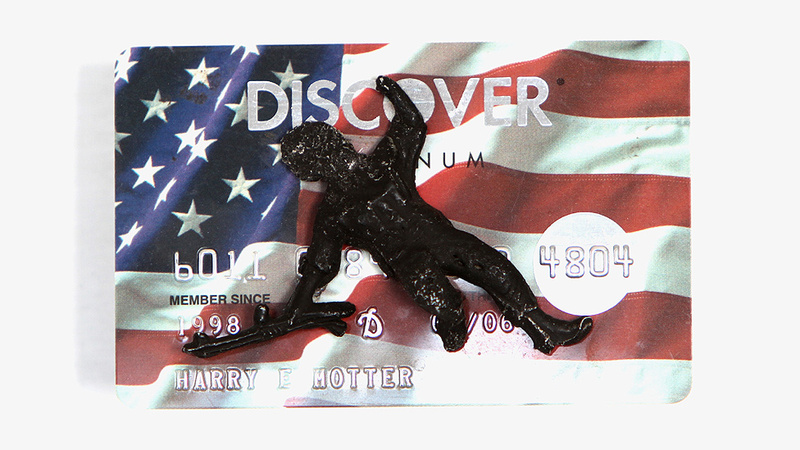 If my name gets out there and I'm able to get more money for my work, I'd like to take cards from people who are in debt and help them pay it off by using their credit cards as art." 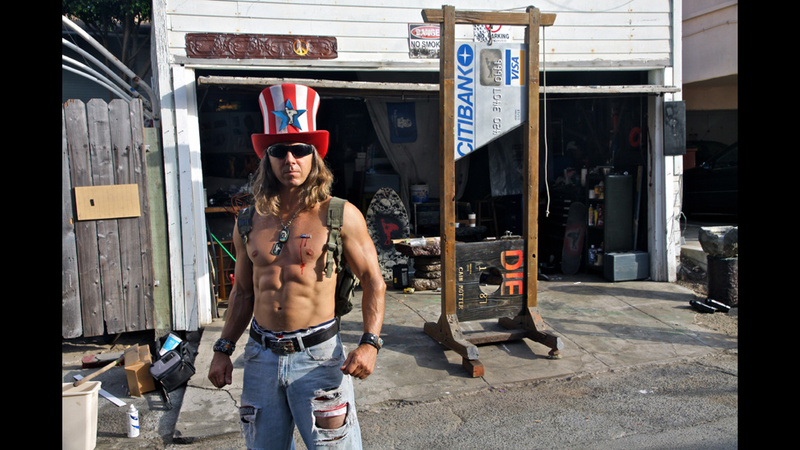 Cain Motter's work is currently on display at Santino's in Venice, California.